Incredibly, and unjustifiably, many conservative commentators and politicians have responded to the Pope’s bold encyclical with harsh reactions, most of which appear unsubstantiated by scientific facts or good sense. The main objections include: his acting like a Marxist (Rush Limbaugh); his directing mankind to worship the Antichrist (Michael Savage); his shaming people into distributing wealth based on “alleged” global warming (Andrew Napolitano, Fox News); and his talking about a new world order (Lou Dobbs). The main retort I have to such nonsense is to raise the familiar question: What would Jesus do? Based on Biblical scripture and scholars’ historical findings, Jesus adopted a simple, ascetic lifestyle; focused on non-material concerns; denounced the powerful religious, economic, and political establishment (recall his conflict with Temple money changers); and spent most of his ministry serving the needs of impoverished and ailing people. How does this vision jive with current interpretations of Jesus—and Pope Francis—by extremely conservative devotees? It’s especially relevant to note that St. Francis of Assisi, from whom the pontiff takes his name and inspiration, exemplified the teachings of Jesus. The Pope’s encyclical has been well publicized in the past week, and considerable information is available in articles listed below, in the Enlightenment and Environment sections. In sum, he clearly states his belief in man-made climate change. He also voices concern about the poor having the most to lose from economic exploitation, which “allows the poor to sink, and the rich to rise”. Based on his overall pronouncements, some supporters are describing the pope as a populist environmentalist who promotes “eco-justice”. May the way people treat the Earth not be guided by greed, manipulation, and exploitation, but rather may it preserve the divine harmony between creatures and creation, also in the service of future generations. Note: Because climate change has been prominent in the news this past week, this issue contains a preponderance of articles on this timely topic. > The Washington Post: Read Pope Francis’s Full Document On Climate Change. In the 192-page paper released Thursday, the pope lays out the argument for a new partnership between science and religion to combat human-driven climate change — a position bringing him immediately into conflict with skeptics, whom he chides for their “denial.” And you can also read 10 key excerpts from Pope Francis’s encyclical on the environment. 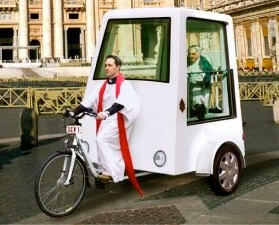 > Post Carbon Institute: Pope Francis Rides An Encyclical (Richard Heinberg). Religious and ethical impulses are powerful shapers of human behavior. That’s why, here in the U.S., corporate leaders long ago found ways to use religion to promote the notions that extreme economic inequality is perfectly fine with the Almighty, and that government regulations are the work of the devil (the story is recounted in this helpful article). > Resilience: Pope Calls For Culture Change (Roundup) (Bart Anderson). Media coverage: Top 10 takeaways, Pope calls for cultural revolution, what scientists say, and an action film trailer. > Star Tribune: Commentary: Pope’s Message On Earth’s Fate Is A Call To Action, Regardless Of Faith (Jason Adkins). Embrace of an integral ecology will mean “redefining our notion of progress” and development, and moving away from models based on growth and consumerism, to one that focuses on the holistic development of people and communities in conjunction with ecological stewardship. Ultimately, it means, for many of us, living with less, so that the poor, and the planet, may have more. > Chicago Tribune: Pope Urges Revolution To Save Earth, Fix ‘Perverse’ Economy (Associated Press). In a sweeping environmental manifesto aimed at spurring concrete action, Pope Francis called Thursday for a bold cultural revolution to correct what he described as a “structurally perverse” economic system where the rich exploit the poor, turning Earth into an “immense pile of filth.” Francis framed climate change as an urgent moral issue to address in his eagerly anticipated encyclical, blaming global warming on an unfair, fossil fuel-based industrial model that harms the poor most. > NPR-MPR: Pope’s Missive On Environment, Poverty Could Affect Habits Of Millions (Sylvia Paggioli). On Thursday, the Vatican released the pontiff’s hotly anticipated encyclical on the environment and poverty. The rollout of the teaching document has been timed to have maximum impact ahead of the U.N. climate change conference in December aimed at slowing global warming — and has angered climate change skeptics. Francis has made it clear that he believes climate change is mostly man-made. > The Washington Post: The World Is Off Course To Prevent Two Degrees C Of Warming, Says Energy Agency (Chris Mooney). The Paris-based International Energy Agency, which provides independent energy analysis and has 29 member countries, including the U.S., stated that current national commitments to cut greenhouse gases are still insufficient to keep the world below two degrees Celsius of warming above preindustrial levels. The agency also shows how the world could peak its emissions by the year 2020 and get onto a safer path. > The Washington Post: Inaction On Climate Change Would Cost Billions, Major EPA Study Finds (Joby Warrick). A global agreement to curb greenhouse gas emissions would prevent nearly 70,000 premature American deaths annually by the end of the century while sparing the country hundreds of billions of dollars’ worth of economic losses, according to a major government study on the cost of climate change. > Daily KOS: Global Temperatures Soaring: 2015 Starts Off The Top Of The Chart & El Niño Is Just Warming Up (Fishoutofwater). 2014 was the warmest year in global climate records but 2015 is on track to be significantly warmer than 2014. The first 5 months were the warmest on record and global models are predicting a super El Niño that could be the strongest ever measured on record or by paleoclimate proxies. Two charts are noteworthy, one illustrating global land-ocean temperature index and another seasonal sea surface temps. > The New York Times: Americans Are Again Getting More Worried About The Climate (David Leonhardt). About 69 percent of adults say that global warming is either a “very serious” or “somewhat serious” problem, according to a new Pew Research Center poll, up from 63 percent in 2010. The level of concern has still not returned to that of a decade ago; in 2006, 79 percent of adults called global warming serious. > Resilience: The Hoax Of Climate Denial (Naomi Oreskes). The work climate deniers are now doing only helps ensure that we will be less ready for the full impact of climate change, which means greater government interventions to come. Put another way, climate deniers are now playing a crucial role in creating the nightmare they most fear. They are guaranteeing the very future they claim to want to avoid. > Daily KOS:10,853 Scientists Agree Global Warming Is Real, And Caused By Humans. Two Do Not (Dartagnan). There is a mountain of scientific evidence in favor of anthropogenic global warming, no convincing evidence against it, and no alternative theory to explain the observed rise in atmospheric CO2 and global temperature. This means that the so-called debate over global warming is an illusion, a hoax conjured up by a handful of apostate scientists and a misguided and sometimes colluding media, aided and abetted by funding from fossil fuel companies and right wing foundations. > Resource Insights: No, BP, The U. S. Did NOT Surpass Saudi Arabia In Oil Production (Kurt Cobb). The world has substantially lower oil production than widely believed, and growth in world oil supplies has slowed considerably in the last several years. Using the BP definition of oil, world production in 2014 was 88.7 mbpd. Using the stricter definition of crude oil including lease condensate, the number was 77.8 mbpd. Big difference! > Reuters: A Year After The Crash, Oil Markets Risk More Trouble Ahead (kai Pfaffenbach). The EIA expects oversupply to last at least until 2017, but others say that the glut could be more permanent as oil loses its share in the world’s energy consumption. > Forbes: Minnesota Is Where You Will Find The New Gold Rush For Solar (Ucilia Wang). Minnesota, the land of 10,000 lakes, is also the epicenter of a solar energy boom. Both SolarCity and SunShare announced plans this week to build solar power projects as part of a new state program to make solar electricity available for purchase to renters and others who don’t want to or can’t install solar panels on their roofs. > The Contrary Farmer: Financial Discretion Equals Happy Farming (Gene Logsdon). A most provocative article in the latest Draft Horse Journal (full disclosure: I write for this magazine regularly) argues that an Amish farm with gross sales of $50,000 has discretionary income after necessary living expenses are paid out than a conventional farm with gross sales of $300,000 (Farming From the Heart, by Chet Kendall, p. 107ff). It seems discretionary income is the key to Amish happiness and success. > Great Transition: Economics For A Full World (Herman Daly). We live in a full world but still behave as if it were empty. The urgent task ahead of us is to create an economy that remains within the earth’s carrying capacity while rethinking the ultimate purpose of the economy itself—as a subsystem of the ecosphere. > Peak Prosperity: Credit Market Warning (Chris Martenson). There are large signs of stress now present in the credit markets. You might not know it from today’s multi-generationally low interest rates, but other key measures such as liquidity and volatility are flashing worrying signs. We all know that this centrally planned experiment forcing financial assets ever higher is simply fostering multiple bubbles, each in search of a pin. As all bubbles do, they are going to end with bang. > Resilience: Property Rights, Inequality And Commons (David Bollier, blog). The commons [a flourishing system of self-provisioning around the world, mostly operating outside of the market and state] provides assured structural access to vital resources and services, outside of the market and state. And in so doing, commons help assure greater equality in societies. Commons help people reduce their costs, fortify their economic independence, and strengthen their political sovereignty. > Daily KOS: An Open Letter To The Guys Who Run The World (Pope Buck I). This satirical, eloquently written letter addresses why the top 1% would benefit from helping the world find solutions to the converging crises on the horizon, beginning with respecting the 99%, whose skills and hard work provided them with the means to accumulate vast wealth. > Inforum: Editorial: Climate Affects Wildlife. North Dakota’s status as one of the most important waterfowl habitats in the nation would be at risk if a warming climate meant drier conditions and thus fewer prairie potholes. Some research suggests climate change will alter precipitation patterns, which could either reduce or expand waterfowl habitat. > Climate Change News: Praised Be: Pope Francis’ Climate Encyclical: Our Planet, Our Home, Our Future. Two things you can do right now to help amplify the pope’s message: 1) Urge your own faith leaders to join the call for climate action; and 2) Urge your local diocese, church, or community group to divest from fossil fuels. > MPR: Minnesotans Embrace Pope Francis’ Statement On Climate Change (Elizabeth Dunbar). In the pope’s encyclical, or teaching document, he called for people to reduce waste, switch to cleaner forms of energy and redefine progress and development. That struck a chord with Minnesota Catholics who celebrated the pope’s message Thursday in St. Paul. > Shareable: A Library Of Things Puts Frome On The Map As A Sharing Town (Cat Johnson). Imagine going to a shop, borrowing anything you like, and returning it when you’re finished. This is the idea behind SHARE: a Library of Things. Opened in late-April in Frome, a town in northeast England, the aim of SHARE is to enable people to spend less, waste less, and connect more. The first of its kind in the U.K., SHARE has already sparked interest from other communities. > Resilience: Reviving The Lost Art Of Fixing (Ute Scheub). At the Repair and Service Center in Vienna, the long-term unemployed retrain to be “mechatronic engineers” and repair electronic devices. Founder Sepp Eisenriegler tirelessly initiates networks, projects, and cafés—all dedicated to the art of fixing things. > Associated Press-Star Tribune: Obama Administration Says Trans Fats Are Health Threat, Tells Food Industry To Phase Them Out (Mary Clare Jalonick). The Food and Drug Administration on Tuesday ordered food companies to phase out artificial trans fats, calling them a threat to public health. Consumers aren’t likely to notice much of a difference in their favorite foods, but the administration says the move will reduce coronary heart disease and prevent thousands of fatal heart attacks every year. > Ensia: Agroecology Can Help Fix Our Broken Food System: Here’s How (Maywa Monenegro). The “agri-food system” is clearly broken—honeybees collapsing, forested landscapes fragmenting, the climate warming), plus the ever-growing number of people without access to nutritious food, or the land and resources with which to produce it. Agroecology embraces complexity, develops the capacity to listen, to grow new connections, and to equally serve animals, plants and people.